I have to admit, I am really excited about this post today! In a world that can throw anything at us at any moment, it's really important to appreciate everything we have been blessed with, all the time. But November seems to be a time when we tend to think about those things more often (at least here in the US). Today I want to show my appreciation for you, because you read my blog. Whether you read every day, every once in a while or today is your first day stopping by! I'm thankful that people actually take the time to read about my bad luck with injuries, my morning runs, races in the park, meals I've cooked, and all the other random things I tell you about. Thank you for your support, kindness and inspiration! Okay, so enough with all the sappy stuff, I'll get to it! Here's the deal: I've stuffed a Lululemon bag full of goodies for one lucky winner! There are 5 ways to enter and each entry must be a separate comment. Just saying, if you combine everything in one comment, it will only count as one entry. 3. Who has made a big impact on your life? And, if you are in a sharing mood, why? 4. Post this giveaway on your blog (and provide the link). Anyone can enter and I'll take entries until 8:00pm est Tuesday November 16th and announce the winner next Wednesday. I'm thankful for our veteran and active military service members. My friend Sam helped me get off of the couch and on my feet. Note: He did it from a seated position, but you get the point. I love running. I'm thankful for the men and women who have fought in the various conflicts now and in the past so that I can run and be free. My coach has made a huge impact on my life. She doesn't coddle me with my running but pushes me to be better, do better and never give up. I'm thankful for legs that carry me wherever I want to run. I'm thankful for the ability to work in peace due to the service of our veterans. I'm thankful for all those those who are serving, have served, and have given their lives for our freedom. I'm thankful for my husband, currently deployed to Iraq. I'm thankful for all the men and women, past and present, who have served and continue to serve. I would have to say, my husband has made a huge impact in my life, we met when we were 18, so I guess you can say we grew up together. Most thankful for is a toughie. Right now I'm most thankful for my running buddies. Without them I wouldn't be able to get out there and get a run in even in the cold, dark hours of 5:30 AM. They keep me going, every day. Biggest impact on my life has and always will be my Mom. She's an amazing lady and has given me so much strength and she's always there encouraging me even now at 31 years old. I only hope that I can be half the Mom that she's been to me. Posting this giveaway on my blog. I follow -- just found you recently! Feeling especially thankful for my two little boys today!! I've linked you in my blog sidebar! I am thankful for three beautiful and healthy children who give me the strength to be the best mom I can be every single day. I'm thankful for the veterans who have served! My friend Patricia has made a big impact on my life. She constantly makes me smile and I love hanging out with her. Hubby had a fender bender last night and I'm thankful it was not any worse. Hubby has made a huge impact on my life. He is the most caring, funny, loving man and is always so good to me. Can you share your Twitter id up in the post? Or I might have missed it? Thanks! I am thankful for my body! I did a triathlon a few weeks ago with some challenged athletes there....totally inspiring. I am thankful that despite my aches and pains, I have two arms and two legs, which help me run, bike and swim! My step-mother has made a big impact on my life in terms of exercise. A lifelong runner, she is now 58 years old and in recent years climbed Mt Kilamajaro, hiked the Colorado Trail, biked from Tennessee to Mississippi, and recently beat me by 10 minutes in a half marathon (and I'm 40!) Very inspiring. Today, I am thankful for a run with my husband (who is off for Veterans Day). My grandma has had the most impact on my life. She really showed me how to live a good life and be a good person. I posted a link to the giveaway on my blog along the right rail. My mom has had the most impact on my life--I parent like her, am a writer b/c of her, and a lifelong reading addict like her! I'm thankful for antibiotics today to rid me of my sinus infection! I'm a follower! I totally thought I already was but you were just on my google reader list but I'm not an official follower--yay. I'm thankful for my legs. I work near a VA hospital and today being veterans day there was a little parade going on and I saw several vets missing limbs. It made me thankful for what I have and was just another reason to be happy with what I can do and stop comparing myself to others. Most definitely my Dad. He has so many wonderful qualities and has really been the person that's taught me the most about life. JK we are twitter buddies! I thought that was strange! My grandma has impacted my life in a huge way! She lived with us for a while before she had to be put in a nursing home... She was my best friend and taught me so many things... we had fun together and when she passed, she left behind a legacy. I am thankful for my two kids and a great husband! I'm thankful that I've almost made it healthy to the starting line of the Philly Marathon on Nov. 21! I am soooo thankful for my Husband! Not to repeat but my husband has been my biggest influence. Over the past 20 years, he has taught me to come out of my shell and have confidence. I'm a follower and a fan! Today, I'm thankful that I have health. It's something that's easy to take for granted, but I'm so blessed to have a healthy mind and body! steph chows sent me your blog :) new follower! My mother has had a big impact on my life. As I get older I find that I am more and more like her and I'm actually really happy about that. Her quirks and idiosyncracies are what make people love her, so I'm happy that I can have some of those same traits. Today, I'm thankful that I have a job that (1) I like, and (2) is flexible enough to let me bring my 4 yr old into the office for an hour while I arrange a sitter because I forgot she didn't have school today. Ooops. My friend B, who inspired me to start running. I'm still new, but watching what she's done, makes me get out there every day and stop whining about my 2 easy miles. I'm a follower who HOPES she's lucky. Whatta a GREAT giveaway. Thanks for hosting! I am VERY thankful for FREEDOM! Got your link love on my blog. My family has made the biggest impact in my life. The sacracfices I make for them contributes to my ever growing love. Everything is for them. Even the solitude I find in my running is for them so I can be more content while attending to their needs. Today I am thankful for this wonderful indian summer weather! Gorgeous leaf-raking day! My mom has really shaped who I am as a person. I'm thankful to have a job that I love and lots of inspiring friends. My aunt has made a big impact on my athletic life. She's the one who first suggested I join her on a leg of her Katy Trail bike ride--"only" 50 miles. I thought she was crazy but ended up doing the whole 240 mile ride with her, and all of my running and riding has come from that experience. She showed me that never having done something doesn't mean I'm not capable of doing it. I am thankful I have 2 healthy and happy girls! My mom made a huge impact on my life before she passed, she was there for the first year of my oldest daughters life and I am so thankful for that! I am a follower and I love your post! I am thankful for a wonderful family and incredible boyfriend. I am also thankful for being able to run post-injury!!! I am thankful for my family. They truly are my lifeline! My grandpa made the biggest impact on my life. He taught me to never give up. No matter what. I'm thankful for such a wonderful daughter (who writes this blog) and my family and being alive and in good health to be able to write this. The lovely Elyssa just directed me over here. 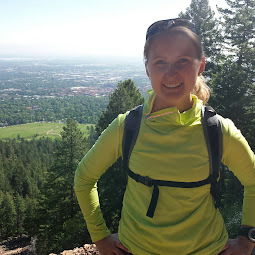 Great blog, and I'm glad to follow and add it to my repertoire of ways to look like I'm engaged in important work at the office while really just reading about running. In the spirit of yesterday's observance of Veterans Day, I'll credit my dad for having a big impact on my life. From my earliest Turkey Trots, he showed me that running was fun. I've never looked back. Also, he made me tall, which is sort of a defining characteristic. And he also likes beers. So thanks for that, Dad! And, you can see my tweet about this giveaway (and our Spartan connection - my sister is at MSU!) @willrunforbeer. Biggest impact on me.... my highschool basketball coach and his wife my English teacher (small school). Two extraordinary people who encouraged their students/athletes to do their very best every time. I still hear his voice in my head as I cross each finish line. I'm thankful that my back is starting to heal and hopefully I'll be running again soon! My boyfriend, Mike, inspires me. His support got me through my first half marathon, and his encouragement has convinced me to go back to school to do something that will truly make me happy. 2. I am thankful that I am healthy enough to run as much or as little as I want to. I've been following your blog for about a month now and I love your posts! Oh, and I am so thankful for the opportunity to spend the holidays with my friends and family, especially my incredible husband. I'm thankful that all of my children are healthy! My Dad has made a big impact on my life by setting such a good example of how to treat people. I posted a link to your giveaway on my blog. Today I am grateful that the sun is shining...and I'm going out to play in it! I am actually thankful that this week is over and done with, that I'm home, my stepkids are here and it's finally the weekend. My husband has actually made the biggest impact in my current life. 7 years ago I fell into a pretty deep depression, we were friends and he was the *only* one who stood by me. and I've tweeted (@lowfatpie). will post it in a blog post this weekend. And I am thankful for my legs which have gotten me through seven-plus years of long-distance running without sustaining any serious injuries. I'm thankful for an understanding and generous husband. Never complains when I enter a race or buy a new running item for myself. My mom and dad have made a lasting impact on my life. They have always encouraged me in anything that I tried to do. I was in your town last weekend for the marathon! First time every in NYC. And I follow your blog. I am thankful for fall and the cooler weather that it brings. My PE teachers in middle school made a huge impact on me, showing me that I loved being active and that I was good at running, especially that I could go further comfortably when others were giving up. Im thankful to have a nice dinner waiting for me tonight! I'm very thankful for my husband! I'm thankful to have found a cool blog about running that happened to be written by a fellow Spartan! Go State! And thankful to be running my first 13.1 in San Antonio Sunday! Inspired by my amazing runner sister in law, Kristin, who took on Boston with grace, my beautiful friend Rhoda (who overcame a car vs. Rhoda running accident), by my cousin Em who ran her first 1/2 last month, and by my husband Nate who makes marathons look like a walk in the park. And of course, my fit and fabulous mom, who kills me in the gym!!! All have impacted my life positively! Im inspired by my mom who works so hard to acheieve anything & everything she wants. I am thankful for two legs that can run. not everyone is so lucky. My friend Selene, has made a huge impact in my life recently, by inviting me to do a half marathon with her. It changed my life, and helped me see that I can be a "real" runner. my daughter-she makes me want to be the best person I can be every single day. I want to "walk the walk" not just talk the talk. I want to be positive role model for her in every aspect of my life :) she is my joy!! I don't tweet, but I FB'd your giveaway, does that count? thankful that I have legs the can move and carry me places! My Papa (grandfather) made a huge impact on my life amongst a crazy childhood. He shared Christ with me and I was able to him live it out everyday. His favorite saying was Keep On Keeping On...hence my blog name! After a weekend away, I am thankful for my lovely home to come home to with my family (and bed)! I'm new to your blog, but now I'm a follower! What a great giveaway! Today I'm thankful that I was able to get in a 6 mile run (haven't been very consistent lately) and that later in the afternoon, I took my kids on a walk to the park! God is good and I'm so thankful for the weather here in Phoenix! As far as running, my friend Meredith http://therapeuticrunningsofamom.blogspot.com/ has made the biggest impact on my life. She is an inspiration to me in the area of running, but so many other aspects of life as well! I just blogged about your giveaway here! I recently started following your blog, I really enjoy it and I love the fact that you are a MI transplant like me! I am thankful to have a healthy, functioning body that lets me do all of the fun active things that I love to do! One of my current professors, Dr. Crowe, has had a huge impact on my life. It was through her that I discovered occupational therapy (for which I am currently in school), and she acted as a mentor and cheerleader as I went through the competitive application process for the OT program in which I am currently enrolled. I am eternally grateful to her for helping me discover and pursue this wonderful career! I follow your blog!! I appreciate your honesty and fun stories! Today I'm thankful for a negative mammogram. My dad has made a big impact on my life. I wanted him to be able to do that for my boys, but sadly, he's passed away. Memories and stories have to suffice. I am thankful for my family - my husband, two adorable little boys. They melt my heart every day -- more than once! I just found your blog through Twitter! I'm definitely going to be a regular follower now! I am thankful for my family, they are so good to me and help me in hard times!